A new startup, SeatID, wants to change the way you fly. Their service lets you use your social network to help pick your next flight and seat assignment. SeatID is available starting today on the Ukrainian airline AeroSvit and the company plans to sign up major international airlines and online travel services soon. Whether passengers will want to share their flight and seat info is a big and controversial question. Eran Savir, CEO and co-founder of Israeli-based SeatID, says everyone has a bad flying story thanks to an awful seatmate. That experience is what inspired the founders to start the company. When you are deciding what flight to take and where to sit, SeatID shows your Facebook friends or LinkedIn contacts on each flight, if they have opted in to the service. Savir argues it’s better to sit next to a friend, a friend of a friend, or someone with common interests or business connections, rather than a total stranger, which is the case now. Savir says while the service could be used for social and dating purposes, the more popular scenario is the business use case. I asked a few folks around the TechCrunch office if anyone wanted so share their seat and flight info. None did. One said ‘flying is not a social thing’ and someone called it ‘creepy’. The SeatID team knows not everyone will opt-in. They have built in strict privacy controls that allows users to decide who they share their information with. SeatID’s privacy rules inherit your existing Facebook or LinkedIn privacy setting and then add additional limits. SeatID says they don’t need many passengers to get started. Their initial target is a 5 to 10% conversion rate, or 10 to 20 people on every flight. Given the nearly 3 billion passengers each year, that would be a huge number of users. There are two parts needed to make SeatID work. The first is people who agree to share information that they will be on a specific flight. Without some passengers who are willing to share this info, the second group won’t know who is available for them to sit next to. If someone decides to sit next to you, you don’t have the ability to reject them. But, you don’t have that ability without SeatID either. Of course, you could try to move your seat. SeatID also knows they need enough users in the beginning to have a network effect and make the service useful. Savir claims once his customers use the service, they won’t want to fly the old-fashioned way, without this social knowledge the next time. I wrote about other companies that have tried to do this nearly a year ago, when KLM announced a “meet & seat” program. But SeatID’s concept is different. They want to work with every airline, something that KLM can’t offer. SeatID says while the airlines are looking to increase their uses of social media, building the technology to do social seating is not their core business. In addition to KLM, I also reported Malaysia Airlines has been experimenting with social seating. But, the airline requires you to book your flight on the airline’s Facebook page, which is not the typical place people book flights. That’s not at all how SeatID works. SeatID wants you to book your flight on the same site that you currently book it on, whether that’s an airline website or a travel ticketing site. But all the passengers who opt in to SeatID when purchasing their ticket on partner sites will see other passengers no matter which ticketing system they used, as long as their privacy settings allow. With their first partnership, travelers can go to AeroSvit’s site and decide if they want to login with their Facebook or LinkedIn accounts. SeatID doesn’t integrate with the backend ticketing or reservations systems of each airline. It only integrates on the frontend so a widget can display who is on each flight. David Rachamim, co-founder and CTO of SeatID says “we’ve built it as a SaaS (software-as-a-service) solution, which makes the implementation onto the customer’s website very simple.” SeatID says they can integrate with a new partner in a few days or less. 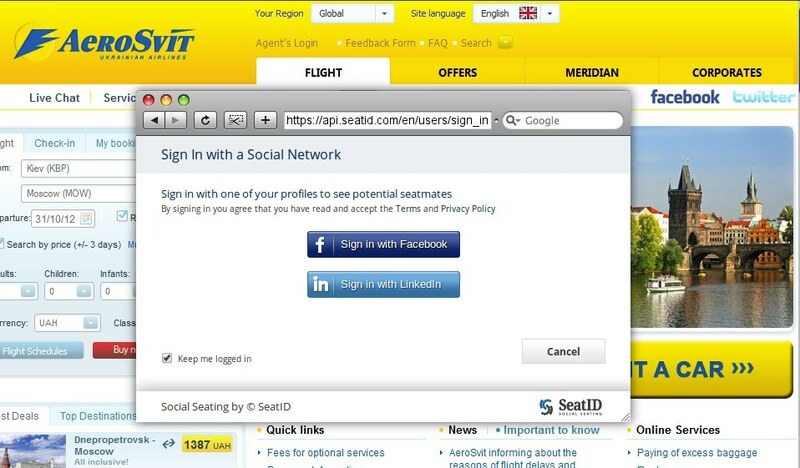 At launch, AeroSvit is only showing ticket buyers in your social networks who are on each flight. The seatmap feature, which shows their seat assignment, has not been implemented yet, but will be soon. When I questioned how valuable this service would be without the seatmap feature, Savir notes that some airlines don’t have assigned seating. So friends could would be able to grab seats together after they board. Savir says SeatID has gotten interest from some of these “no seat assignment” carriers, but wouldn’t name them until a deal is reached. SeatID has raised seed funding, but they won’t disclose the amount. For the first customers, the service is free and SeatID would like it to stay that way. They hope to make money by licensing the software to the airlines. If airlines discover this creates great value for users, airlines might charge passengers to use it. For now, SeatID is only available on AeroSvit, based-in the Ukraine, with its 80 international routes to 34 countries. At best, SeatID could make your flight much more enjoyable. SeatID might also help you avoid sitting next to a screaming baby. However, if you pick a flying companion that turns into a nightmare, you can’t just leave. Of course, you can always put on your headset or go to sleep.